President Mnangagwa has guaranteed the sanctity of private property, and reassured foreign investors that they can repatriate their profits as provided for by Zimbabwe's laws. 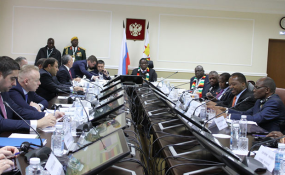 Zimbabwe's leader enjoined Russian businesses -- who under their Federal Chamber yesterday signed a memorandum of understanding with the Zimbabwe National Chamber of Commerce -- to seize opportunities in the country. President Mnangagwa welcomed co-operation in sectors such as oil and refined oil products, natural gas, coal-bed methane and related by-products, tourism, manufacturing, agriculture and agri-equipment, fertilisers and agri-chemicals and other areas that offered lucrative returns on a win-win basis. "To this end, we have embarked on a bold course to grow, modernise and industrialise every sphere of our country's economy through vibrant private sector participation. "This broad economic agenda has seen my Government, with a great sense of urgency, effecting sweeping and comprehensive economic reforms which foster an investment friendly environment; promotes and protects private enterprise; improves the ease and cost of doing business; reduces the country risk perception; creates employment; eradicates corruption and enhances public sector accountability, transparency and good corporate governance. "In all our endeavours, we are determined to improve the quality and standard of living of all our people," the President said. "We are cognisant that foreign direct investment will play a major role in facilitating the economic growth and development to achieve our vision to build a middle-income economy by 2030. "Hence, we invite Russian investors to come and do business in Zimbabwe, and take advantage of this defining economic period we are in -- that of immense strategic opportunities. We have entered a new era."